I'm lucky enough to be part of 24 Merry Days, a cheerful project by the lovely Audrey of This Little Street (her blog is a delight). Each day in December leading up to Christmas, you’ll be able to visit one of 24 bloggers offering an exclusive holiday giveaway with the most fantastic prizes. Plus I bet you'll fall in love with some amazing blogs. The first giveaway starts today on 79 Ideas- hop on over there to unveil the prize! To spread the love, everyday on Twitter, Facebook and here on the blog, I'll let you know where the giveaway of the day is taking place. 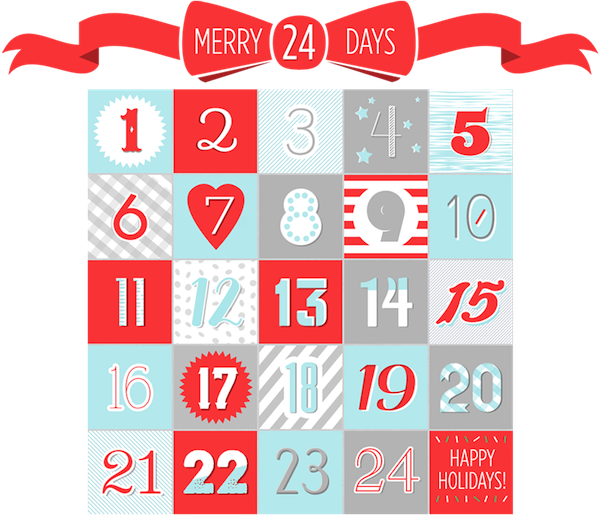 You can also visit the 24 Merry Days page (it has the cutest design, created by Gloria of Little White Whale) to learn about the giveaway schedule, as well as find a list of all participating bloggers and brands offering prizes. Hope you'll enjoy this advent calendar! What a fun project, I didn't know about it. Off I go to visit! That's a great idea! I love seeing the blogger community fitting together; and I can't wait to see what each blogger brings! I'm so happy to have heard about this! What a fun way to countdown to xmas :).